SEATTLE - The orca J50 was presumed dead Thursday after a search for the whale by boat, plane and from shore failed to spot her. About 4:30 p.m. Thursday, Ken Balcomb, founding director of the Center for Whale Research, declared J50 presumed dead. He is on contract with the National Oceanic and Atmospheric Administration as the keeper of demographic data of the southern resident population of orca whales. "We have had a huge amount of help today, and it is really important that if she is there that we find her," Milstein said. "We certainly have not determined at this point that we are giving up. And we are determining that day by day, we are not setting a timeline." A massive search was mobilized for J50 all day Thursday on both sides of the border. The search in Washington waters included a Coast Guard helicopter, several NOAA researchers in separate boats, Soundwatch, the boater education nonprofit, and multiple whale-watch vessels, as well as members of the West Coast Marine Mammal Stranding Network. In Canada, the Marine Mammal Rescue vessel, the M Charles midwater patrol vessel, Straitwatch, a nonprofit, a Coast Guard helicopter, the Department of Fisheries and Oceans enforcement airplane and a floatplane all were deployed. But while always small for her age, J50 became the object of scientists' concern as over the course of 2017 and this year she lost more and more weight. She became so emaciated it became increasingly hard for her to swim and hold her head up, as the fat pad in her cranium shrank, reducing her buoyancy. The National Oceanic and Atmospheric Administration (NOAA) mounted a progressively more intense effort involving veterinarians and biologists from Canada and the U.S. to save her. Finally this week, the agency announced a plan to capture the whale and take her into temporary captivity for assessment and, if possible, rehabilitation since all efforts to treat her in the wild had failed. The agency said it would act immediately if the whale stranded -- turned up on a beach, or was unable to swim. Debate swirled over whether the agency should act, or why it hadn't acted sooner, and the ethics of such extreme intervention. 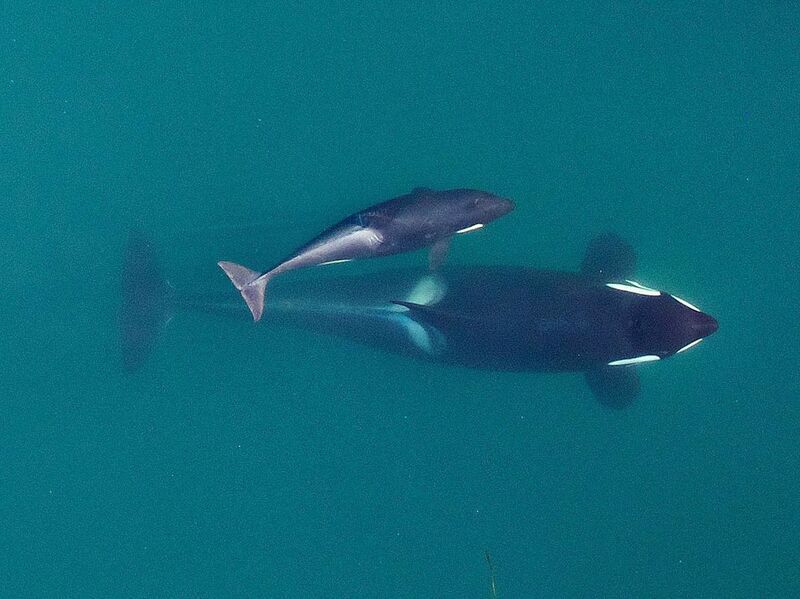 J50 was the first of the "baby boom" among the southern residents that caused so much celebration in late 2014. Of the 11 babies born between December 2014 and January 2016, only four now are known to still be alive. 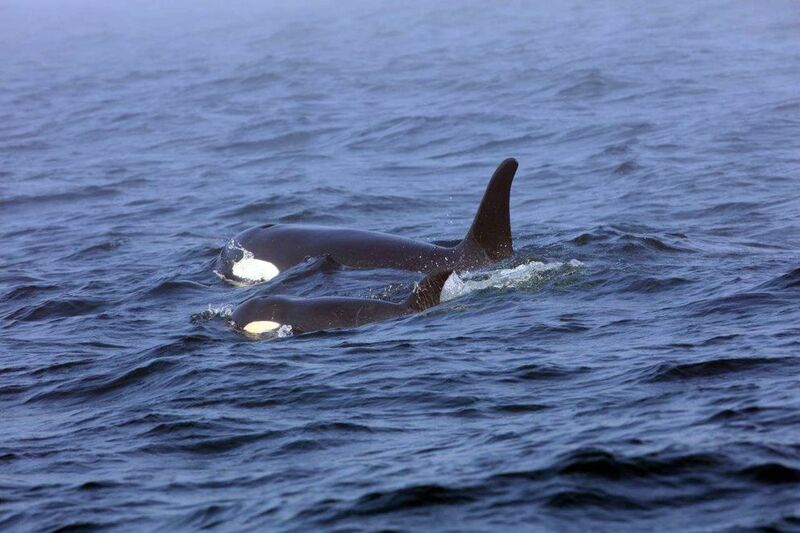 Biologist Deborah Giles, research scientist for the University of Washington Center for Conservation Biology and research director for the nonprofit Wild Orca, used to often see J50 babysat by her brother, the largest of J pod, with her the smallest. "They were really sweet together," Giles said. She was a spunky whale with an independent streak, Giles said, spending time off on her own while her family foraged. She also glided along in the slipstream of her mother, J16. "You could see she just wanted to be lifted up all the time; these whales are very playful, they will lift up their calves and toss them, and the calves will swim over their backs." Known for a belly flop achieved by launching her body out of the water, "she just had a really sweet personality," Giles said.